Selecting the right lighting can completely tranform a space from boring to va-va-voom. We are remodeling our kitchen. What are the best options for using LED lighting for the different types of lights needed in this room? There are many options available today in the LED lighting category. Recessed downlighting and undercabinet lighting offer the most product options. A number of lighting manufacturers have developed a comprehensive line of LED products for use in residential applications. The websites of several ALA-member manufacturers, such as Progress Lighting , provide an array of quality products designed to suit your need. The Internet and your local ALA-member lighting showroom are great sources of information about the many LED products available including the quality and amount of light they produce. To obtain a first-hand look at the newest LED products on the market, click here to find your closest ALA Visit ALA on Facebook showrooms. Sometimes it is best to hear lighting and design tips directly from the source. Click here to view videos of design professionals talking about how to create your perfect space. Contact an ALA-member showroom to get a personalized lighting design plan for your home. HGTV’s Front Door lists changing out lighting as one of the five best value projects to add appeal to your home. Other value adding projects: cleaning and decluttering, painting, updating cabinet hardware, and adding decorative molding. Lighting can completely transform a space by affecting mood, enhancing the design and architecture, facilitating specific tasks, and creating a focal point. A popular lighting trend is the use of LEDs (light-emitting diodes). Though more expensive than regular incandescent light bulbs, LEDs last much longer, are more durable, do not flicker and withstand temperature fluctuations. To bring out the best in your home, it is imperative to understand the different types of light sources. For example, some areas, such as a kitchen, require task lighting, while other areas, such as a bathroom, may need more ambient lighting, and other rooms will need various light combinations. To read the HGTV article, click here. 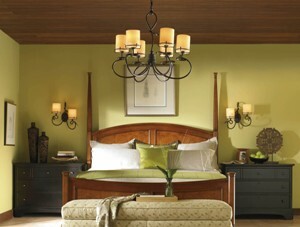 To find the best lighting for your unique space, consult with a lighting specialist at an ALA-member showroom.